CHARLOTTE, N.C. (Nov. 8, 2017) – Dalton Sargeant and MDM Motorsports are proud to announce their debut together at Phoenix Raceway on November 10 and then the 2017 NASCAR Camping World Truck Series (NCWTS) season finale at Homestead-Miami on November 17. Sargeant, a member of the 2015 NASCAR Next class who already has four career NCWTS starts will pilot the Performance Plus Motor Oil No. 99 Chevrolet Silverado with the same familiar colors that he drove to victory lane at Iowa Speedway in ARCA Racing Series competition earlier this year. Sargeant is no stranger to Phoenix Raceway after finishing 4th in the K&N Pro Series event in 2015, as well as competing inside the top-10 in the Truck Series event that same year. Although Phoenix is a familiar setting, Homestead-Miami Speedway holds a special place for the 19-year-old rookie driver from nearby Boca Raton, FL. Performance Plus Motor Oil will make their third start with Sargeant, already scoring a victory in their debut race together at Iowa Speedway in ARCA Racing Series competition this past July. MDM Motorsports has also visited victory lane in 2017 in both the Camping World Truck Series with Darrell Wallace Jr. and the ARCA Racing Series with five different drivers. The No. 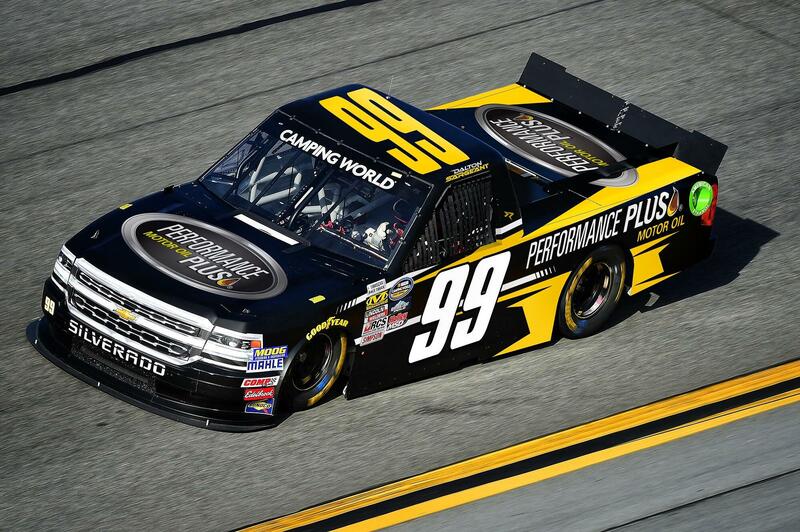 99 Performance Plus Motor Oil team will be led by veteran crew chief, Shane Huffman, who has a combined seven starts as a crew chief at Phoenix and Homestead. "I know this MDM team is ready to go back to the race track with something to prove these last two races and having a driver of Dalton's talent and ability will certainly make that achievable," said Huffman. "I've had some fast trucks at Phoenix the past two years, so I know we'll have a good setup for Dalton, and Homestead will be the same truck that we took to victory lane at Michigan, so all of the pieces are there for us to finish out the season strong. I've watched Dalton the past few seasons and have seen his progression as a driver firsthand, and I think we can help him accomplish his goals." The Lucas Oil 150 from Phoenix Raceway will take place Friday, November 10 at 8:30pm EST and will be televised live on FS1. Practice will take place from 11am-12:50pm EST and can be seen on FS2 with qualifying at 5:30pm EST on FS1. Keep up with all the Dalton Sargeant news, live updates and media content on Facebook, Instagram and Twitter (@DaltonSargeant) as well as DaltonSargeant.com. Performance Plus is the high quality brand of motor oils and lubricants that perform better even under the most extreme conditions. The brand uses conventionally refined oils and proprietary, twice-refined oils, blended with industry-leading additives, to meet or exceed all industry certifications, licenses, approvals and OEM warranty requirements. With more than 30 years of innovation, research and testing, the formulations outperform under the demanding conditions of U.S. military combat vehicles and racing engines from Daytona to Indianapolis and the Bonneville Salt Flats. Visit PerformancePlusOils.com. Additional information about MDM Motorsports is available at www.MDMmotorsports.com, find us on Facebook and follow the team on Twitter @MDMmotorsports.